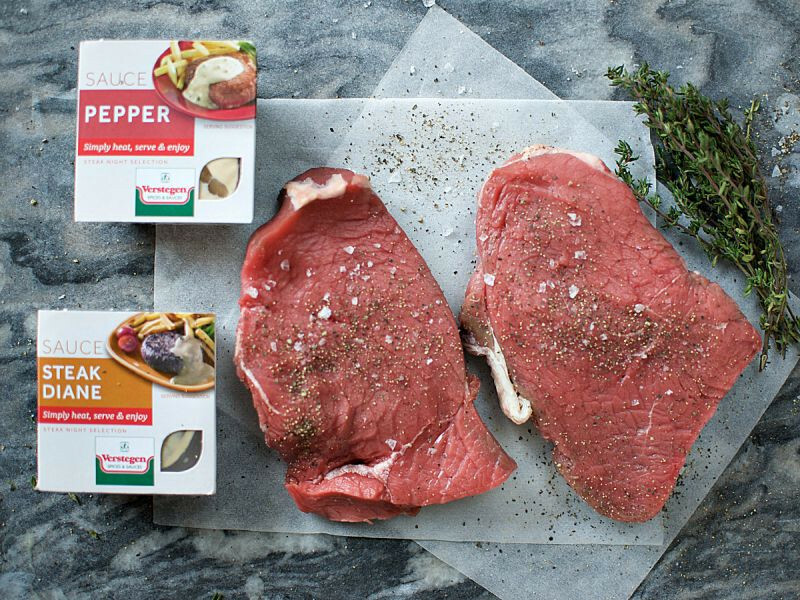 Contains: 2 x beef rump steaks, 80ml pepper sauce & 80ml Diane Sauce. Pepper Sauce Ingredients: Water, sunflower oil, fat powder (butter oil, glucose syrup, milk protein), milk protein, modified maize starch, wheat flour, salt, broth (concentrated beef broth, maltodextrin, glucose, yeast extract, salt, sugar), whiskey, flavourings (contains flavour enhancers: mono sodium glutamate and sodium guanylate, milk, celery, soya), tomato, 0,5% peppers, acidity regulator: glucono-delta-lacton, stabilizer: xanthan gum, thickening agent: guar gum, food acids: lactic acid and citric acid, preservatives: potassium sorbate and sodium benzoate, colourings: caramel class 1 and natural carotene, antioxydant: ascorbic acid. 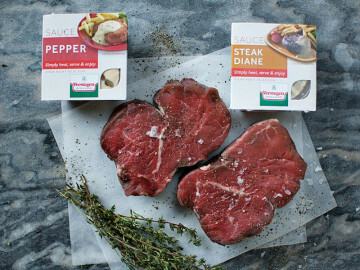 For sauce- Heating instructions: Remove outer packaging and peel back or pierce holes in the plastic foil and microwave for 20 sec. on full power (800W). Adjust times according to the power settings of your microwave. Leave to stand for 1 minute, stir & serve. Beware container & contents may be very hot! Empty contents into a small saucepan & heat on a medium setting, stirring continuously. Remove outer packaging and heat the un-opened container in a pan of simmering hot water for 3 minutes. Do not boil. 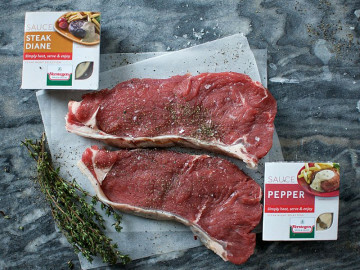 These flavoursome steaks are delicious flash-fried and sliced, with a duo of mouthwatering sauces to choose from.